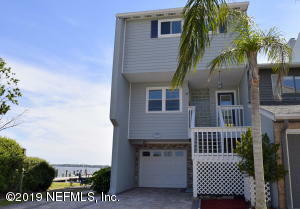 Beautiful 3-story town home overlooking the St. Johns River located in Fleming Island! Enjoy waking up to stunning sunrises from all three floors through a wall of glass doors. Kitchen includes stainless steel appliances with plenty of storage spaces. Sip a chilled glass of wine on gorgeous sunsets from the wine chiller at in the wet bar. Spacious bedrooms and large, relaxing master bathroom. Store your boat with the private dock and water access right in your backyard!